Happy New Year! Pop the champagne or a variation of it. Try a Bellini! This fantastic drink originated at Harry’s Bar in Venice in the 1930s. Made with peach puree, champagne, and a dash of grenadine, it’s a delightful way to ring in the new year or celebrate any festivity. In Italy, the drink is made with Prosecco, a sparkling Italian white wine. 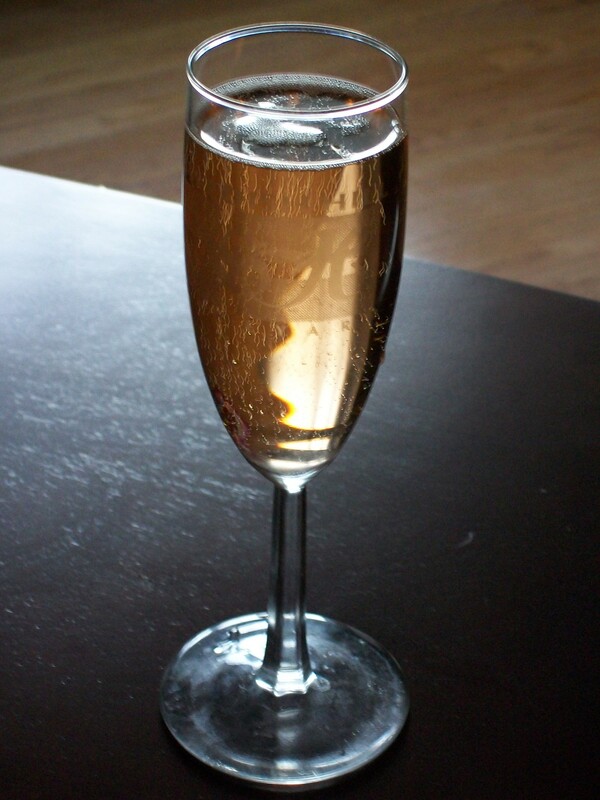 Here, the drink is most often made using champagne. What you’ll need: 1 ounce of pureed white peaches (alternatively use an equivalent portion of peach schnapps), a dash of grenadine, and your favorite champagne or sparkling white wine. Put the peach puree (or an ounce of peach schnapps) into a champagne glass with a dash of grenadine. Fill with chilled champagne. How I like it: Generally, when I’ve had a Bellini, it’s been served with peach schnapps, so that’s what I used. And it’s quicker. However, if you can get a hold of white peaches and puree them, use them. The taste is superb. Also, it is possible to replace the grenadine with something like chambord, which is raspberry flavored, for a little flair. A note on the photo: I used one of the fluted glasses I purchased some years ago at the Swedish Hill Vineyard in the New York Finger Lakes region. You may be able to see their etching on the glass. In place of champage, I used a Swedish Hill’s Blanc de Blanc sparkiling wine, which I find rather similar in flavor.